Making a more vibrant, growing and greener community – Increasingly we are becoming more aware of where our food comes from and the importance of good nutrition to our health and wellbeing. Over recent years there has been a revival of people growing their own fruit and vegetables and an increase in artisan food producers. Growing our own, supporting local producers and rearing our own food can play a significant role in creating a secure environment for future generations. Buying local and seasonal items also helps to cut down on food miles and supports the local economy. Reducing our food waste is very important too, in Scotland alone we are wasting 630,000 tonnes of food per year. Doing just one thing differently – small changes can have a big impact. Growing your own – Seek advice from other gardeners about which varieties grow well in our area and speak to your local plant nursery (e.g. Abriachan or Highland Liliums nursery) as they should be able to supply with a wide range of suitable seeds and plants. Even if you don’t have a large garden it is possible to grow some varieties in tubs or introduce some more decorative varieties into your flower beds. 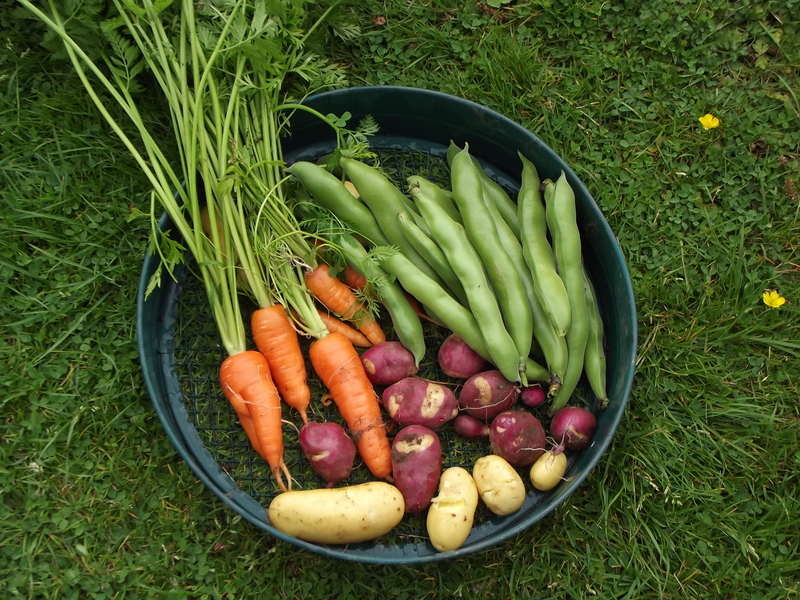 For useful information visit Grow Your Own Scotland an initiative which seeks to create a single resource for all grow your own & greenspace organisations throughout Scotland. Crofting – If you have access to few acres of land or a croft and are considering keeping livestock or growing on a larger scale it might be advisable to take a crofting course to gain a better understand or to develop a particular skill anything from fencing to keeping livestock. Keeping poultry – Whether you just want a few hens to lay fresh eggs or for their meat, there are a wide range of varieties out available so it pays to do a bit of research. Layer birds will produce a lot more eggs than a table bird. Ducks can be good layers too and they will cause a lot less damage to your garden if you want to let them free range; they are also very good at keeping the slugs and snails under control too! Keeping Bees – Ever wondered where all the food that you eat comes from? Well it might surprise you that a significant proportion is provided by bees one way or another. Bees play a part either pollinating the many vegetables and fruits we eat directly, or pollinating the food for the animals that we then consume. And that’s not all bees do for us – honey and wax are two other important products that come courtesy of bees. But honey bees are disappearing globally at an alarming rate due to pesticides, parasites, disease and habitat loss. If you really want to make a change consider becoming a bee keeper, to learn more contact your local (association Inverness or Dingwall) Bee Keepers Association. Buying local – Buying locally produced means that you not only know where your food has come from but you’re helping to support the local economy and dramatically reducing food miles. To find locally produced food visit Farmers markets and farm shops.